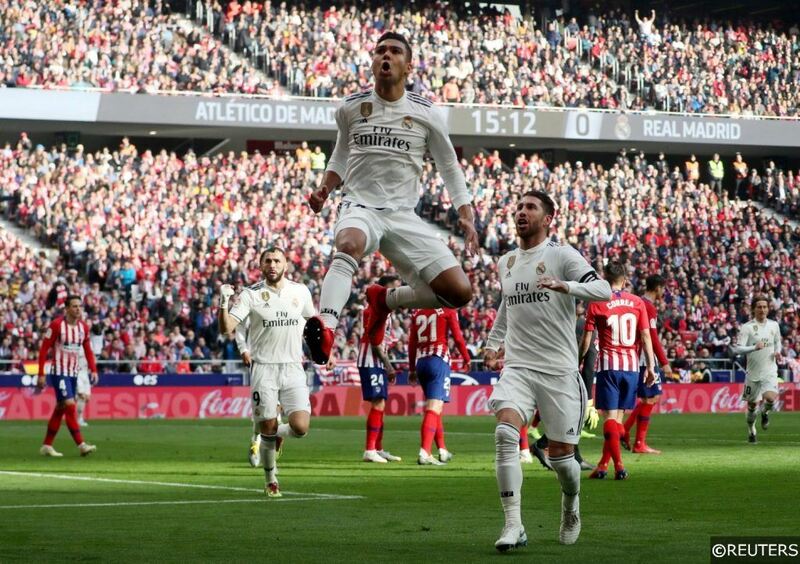 One of the most eventful Madrid derbies in recent years in La Liga took place on Saturday as Real claimed a truly significant victory at the Wanda Metropolitano. That combined with Barcelona’s failure to claim all three points in Bilbao the following evening suggests Los Blancos may just be back in the title race having looked all but out of contention a month back. Santi Solari’s men are certainly the form team in Spain right now and will take real momentum into their Champions League clash with Ajax this Wednesday. Elsewhere in La Liga this weekend, there was another setback for Sevilla with coach Pablo Machin on the end of some criticism during their home draw with Eibar. At the bottom, there were significant wins for Espanyol, Leganes and bottom club Huesca, who have now won back-to-back games and kept 3 straight clean sheets to breathe life into their fight for survival. Only the second Madrid derby to take place at the Wanda Metropolitano saw Real extend an impressive away record against their city rivals. They’ve only suffered one league defeat away to Atleti this century and that never seriously looked like becoming two on Saturday in a game that saw both Thibaut Courtois and Alvaro Morata line up against their former clubs. Courtois, who had toy rats thrown in his direction by the Atleti fans, had more to celebrate and he was not shy about doing that when Casemiro gave the visitors the lead with an acrobatic effort after just 16 minutes. Antoine Griezmann narrowly broke the Real Madrid offside trap to level just 9 minutes later on an afternoon of several marginal calls. The next saw Real Madrid awarded a penalty, which was converted by Sergio Ramos just before the interval. Atleti had their moments in the Second Half but even Diego Simeone was willing to admit that Los Blancos were worthy winners, with a 3-1 victory rounded off by Gareth Bale’s 100th goal for the club in the Second Half. Atleti had only conceded 4 home goals all season prior to the game. It was only their second ever league defeat at the Wanda Metropolitano and it saw them leapfrogged by their in-form city rivals in the league standings. No fewer than four decisions in the Madrid derby were referred to VAR and it was perhaps the first time the technology has been used to have a truly decisive outcome on a big game in Spain. Atletico Madrid’s official account tweeted some dubiously timed still-frames after the match that appeared to show how they had been wronged by three of the major calls. However more than anything, the game was clear evidence that few things in football are black and white and VAR certainly hasn’t removed the debate. The controversy included some marginal offside calls that in truth could have gone either way and a penalty decision which was largely down to the referee’s interpretation. Real Madrid may have had the better of the calls, with a brilliant Morata goal chalked off for offside after the break, but right now they look the superior side in the Spanish capital. Atleti have lost both matches since signing the forward from Chelsea last month, having gone 19 without defeat in all competitions prior to that. Athletic 0-0 Barca: Catalans drop points again despite Ter Stegen masterclass. This could easily have been the weekend where Real Madrid’s title hopes were firmly extinguished. Instead they took another bite into Barcelona’s advantage after the Catalan giants were held to their third straight draw in all competitions, following games against Valencia last weekend in La Liga and then the midweek Copa del Rey clasico. Barcelona, who were missing Jordi Alba to suspension and Arthur to injury away to Athletic Bilbao, missed both men badly. They struggled to ever truly take control of the game in the middle of the park or offer much threat from wide areas. Leo Messi started the game but doesn’t look 100% fit, which is a worry heading into a crucial phase in the season. In truth, it was a game Barca could easily have lost. Athletic Bilbao created the better chances and they continue to improve, having replaced Eduardo Berizzo with Gaizka Garitano earlier in the season. The latter has made them much tougher to break down while also getting the best out of forward Inaki Williams. Athletic are still only 4 points above the relegation zone but are also just 5 points off the European places so there is plenty left for them to fight for over the remainder of the campaign. Where does this leave the Title Race? Barcelona’s inability to take maximum points from either of their last two matches has just opened things up a bit. While they retain a 6 point cushion, it is significant that it is now Real Madrid as opposed to Atletico Madrid who are their closest challengers. It’s hard to see Diego Simeone’s side clinching the title, particularly with just a 27% win ratio on the road which suggests they could easily drop plenty more points between now and the end of May. Real Madrid though, have come through a tough run of league games with 5 straight wins and they will be expected to win their next two heading into the clasico in early March, the last of three meetings between Barcelona and Real Madrid in 25 days. That is now shaping up to be a game that could have a genuine bearing on who wins the title. Barca have a real tricky run coming up where they face four straight away games in the space of 12 days in all competitions. It will see them travel to Lyon in the Champions League, Sevilla in La Liga and make two trips to the Bernabeu in league and cup. That will test their squad to the very maximum and it will concern Ernesto Valverde that they’ve tended to struggle this season whenever they’ve opted to rest players or have been without a few key men. Unquestionably Barcelona are still the firm favourites to win La Liga but a resurgent Real Madrid now look capable of at least pushing them all the way. Categories: Blog and Football. Tags: Alvaro Morata, Casemiro, Gareth Bale, and Thibaut Courtois. Team Tag: Atletico Madrid, Barcelona, and real madrid. League: Spanish La Liga. Sports: Football.